In the early days of Australian settlement, it was not very easy to convince skilled tradesmen to migrate. With the American colonies, promises of land and wealth and freedom, combined with the relative proximity of being only one ocean away, made it easier, but Australia was just too far from home and, in the early 1800s, the colony did not have a great reputation as a destination. So certain people responsible for finding the needed skills for the new colony hit on a plan. They would hire beautiful, young women to hang around bars and buy drinks for tradesmen with the requisite skills. When the tradesmen were adequately anesthetized, these girls would plant on them something stolen from someone else, and then immediately report to a conveniently placed constable that a crime had been witnessed. The targeted tradesmen would be caught “red handed” and still under the influence, and within days, he’d be on a ship bound for Van Diemen’s Land, as Tasmania was originally called. This practice was popularly memorialized in the song “The Black Velvet Band,” with the velvet band in question tying up the hair of the lovely young maiden employed in rounding up tradesmen. Most versions start with the story’s events in Belfast, but there are versions of the song that replace this with any number of locations in the British Isles, as Ireland was by no means the only target of the practice. Today, it’s hard to find an Irish or Australian folk band that doesn’t include this song in their repertoire. 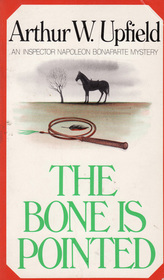 Bony is the hero of a series of mysteries written by Arthur Upfield, who was born in Britain but lived in Australia most of his life. The depth of Upfield’s familiarity with the outback and its people make the books particularly enjoyable for those who love Australia, but the audience has never been limited to Australians only. Descriptions of the weirdly beautiful scenery of Australia’s more remote areas are accurate but also wonderfully evocative–and necessary, because in these books, the land is a key element. However, these well-crafted books have been long-time favorites around the world for nearly a century now primarily because of the beautifully developed character of their hero. These mysteries would be more along the lines of Sherlock Holmes than they are of many gun-heavy modern mysteries. The murder has already taken place before Bony arrives on the scene, and the pursuit of the bad guys is an exercise that combines Bony’s considerable intelligence and Western education with his Aboriginal skills and experience. One comes to feel, after having read a few of these books, that one would recognize Bony if one were to meet him on the street. Little quirks and details, such as his inevitably badly rolled cigarettes, make me smile with familiar affection, as I feel I have come to know this remarkable man. I don’t know that you need to care a great deal about mysteries as a genre to enjoy these books. They are so evocative of time and place, offer such insight into the cultures of the outback and of Aborigines, and are so finely drawn, that all you really need to care about is a good story. The nice thing is, if you do find Bony appealing, there are lots more adventures for you to enjoy.